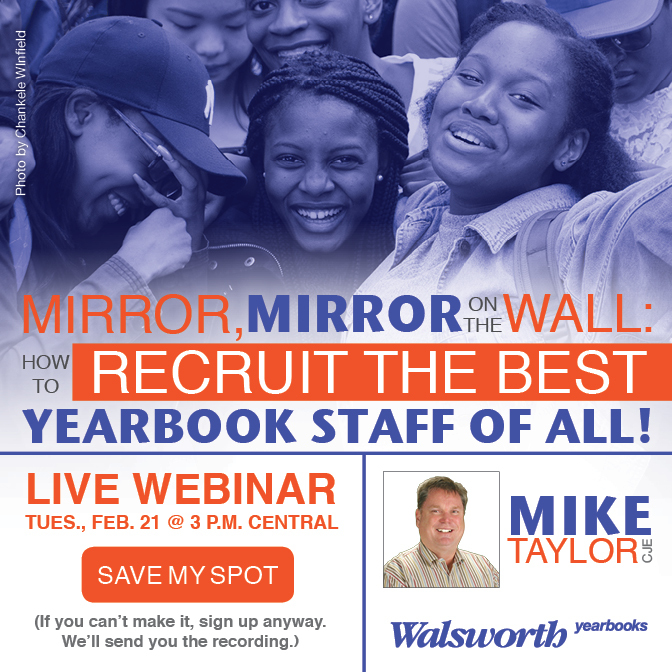 Walsworth Yearbooks will kick off its new monthly webinar series when Journalism Specialist Mike Taylor, CJE, hosts Mirror, mirror on the wall: How to recruit the best yearbook staff of all! on Tuesday, Feb. 21 at 3 p.m., Central time. As you work on wrapping up your 2017 books, it’s time to start looking toward next year’s staff. Recruiting talented, enthusiastic kids is the foundation of all good yearbook programs, and Taylor will explore how it’s about more than just tracking down the class valedictorian or the most popular students involved in the most activities. Great yearbook staffs are comprised of the right mix of personalities that can work together. You can sign up for the webinar by visiting https://www.walsworthyearbooks.com/recruiting-webinar. February’s webinar on recruiting will be the first of a new series of web events that will take place each month, each time on a new timely topic designed to help advisers navigate through the year.